Robert offers spacious prestige accommodation for up to six people. The forward cabin houses two people in convertible beds – either one double or two singles, and there are two other cabins, each with shower room and double bed. 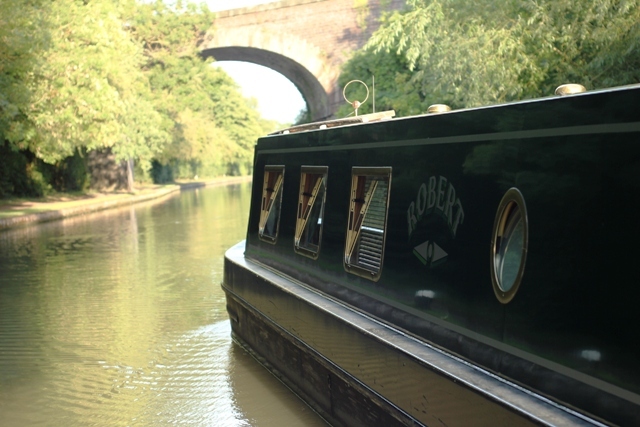 The steel hull narrowboat features a cruiser stern, with the front well deck area extended to give additional external seating. The forward lounge gives a dining area with removable table. The flexible seating converts either to two single beds or a double. The adjacent galley is equipped to our usual high standard with ample storage space. There is also a side hatch which provides ventilation and easy access. The middle cabin includes a shower room with shower, vanity basin and toilet. There is a permanent double bed with wardrobe, under bed drawers and cupboards above. 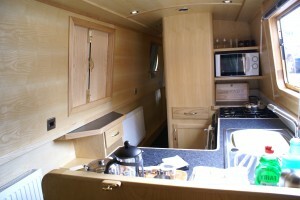 The aft cabin is similarly equipped with en-suite, toilet and double bed. As you would expect, the boat is centrally heated, fully carpeted and provided with a 240 volt power system. There is also a colour TV with DVD, stereo system with cassette and CD players. The rear bedroom has a further colour TV.